These drawings—architectural exercises, really—are part of the bid that Diego de la Sierra, then living in Puebla de los Angeles, made to become “maestro mayor,” or master architect, in New Spain. In them, he demonstrated his knowledge of the vocabulary of European architecture. In order to prove his knowledge, Sierra had to draw roof framing and tiling to show he knew something about construction techniques. Roman orders of architecture are arrayed in the columns from left to right: Tuscan, Doric, Ionic, and Corinthian. A fifth, composite order appears on the reverse. 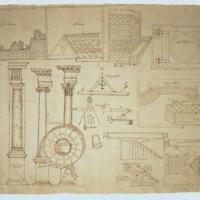 Described by Vitruvius, the orders were explored in Renaissance architectural treatises. Sierra also included plans for a square castle in a moat. A plan for a round castle is the disc superimposed on the columns below. The center of the page is dominated by Sierra’s tools of the trade: a level and rule, a compass and measuring rod. Diego de la Sierra (ca. 1656-ca. 1711) was born in Seville, but immigrated to New Spain where he worked in both Mexico City and Puebla. He left behind a rich record of self-promotion, to which this document belongs, but no other drawings or plans by him seem to have survived, and few of his buildings have escaped modifications through time, which makes his architectural style difficult to assess. The drawing is part of a “Probanza de méritos y servicios” that Diego de la Sierra prepared. Such probanzas were part plea, part job application for the post of maestro mayor of New Spain, the highest official post an architect could hold in the viceroyalty. He was never given this post, but eventually won a lesser, yet important post of maestro mayor of the city of Puebla. 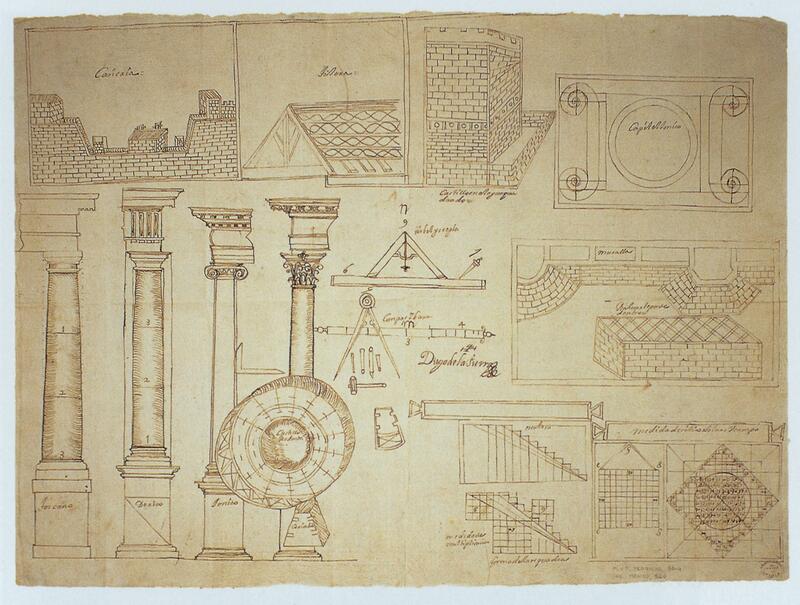 In his drawing, Sierra carefully chooses examples of the practical skills that architects were supposed to have—like masonry and vaulting. But dominating the sheets are the columns, drawn from European architectural treatises. His knowledge of classical orders seems to have been key in his appeal to the Spanish-based Council of the Indies for confirmation as “maestro mayor.” Like other architects of the day, Sierra had to pass local examinations to practice his art, but looked to Europe for models as well as advancement. Fernández, Martha. 1986. Retrato hablado: Diego de la Sierra, un arquitecto barroco en la Nueva España. Mexico City: Universidad Nacional Autónoma de México.